The North Carolina triathlon was the fourth of five sprint triathlons completed in consecutive weekends during the fall of 2018. Following the Lake Lanier Islands Triathlon in suburban Atlanta, Joy and I traveled to the South Carolina coast and then on to central North Carolina. Frankly, we were not sure what to expect in the aftermath of Hurricane Florence. This hurricane had dumped over three feet (91 cm) of rain in some parts of the Carolinas within the past two weeks. While some roads around Myrtle Beach, South Carolina remained closed due to flooding, we were able to travel through the area relatively easily. Sadly, we saw a number of houses still partially under water. There were also many downed trees and twisted road signs. After two days exploring Myrtle Beach, we headed northwest for a couple of days touring Raleigh. Mid-Thursday, we made the short drive through the countryside to Wilson for sightseeing in this historic city and for the Battle at Buckhorn Triathlon. On Friday morning, we visited Drew Parker at the Wilson Welcome Center to learn about the city. Drew pointed us to several landmarks, including Vollis Simpson Whirligig Park, a collection of “kinetic sculptures” designed and produced by the colorful and creative Vollis Simpson. As near as I can tell, Mr. Simpson must have loved biking given the number of sculptures involving cyclists. For the next several hours we visited Whirligig Park and explored the residential streets with their southern style mansions and the business district of downtown Wilson. Video showing some of the sculptures at Vollis Simpson Whirligig Park, Wilson, North Carolina in action. The Battle at Buckhorn Triathlon, managed by FS Series Events, (Raleigh, North Carolina), included both individual and relay sprint distances. The mascot for Buckhorn Lake and namesake for the Battle at Buckhorn Triathlon. 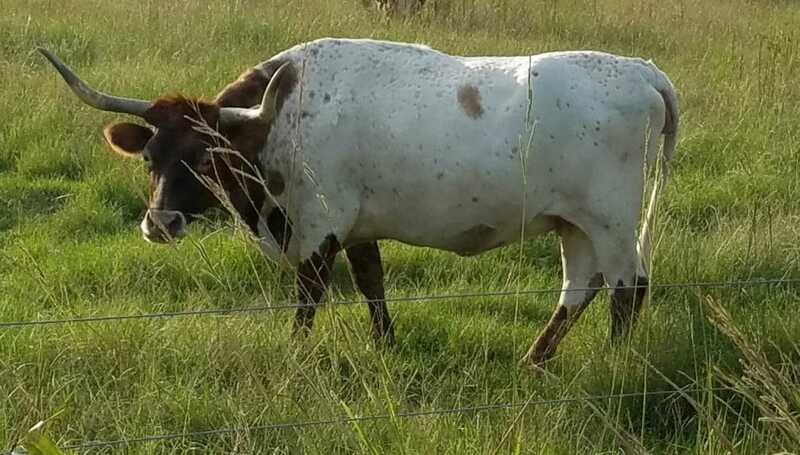 Both the bike and run courses took us past a pasture with this and several other Texas Longhorn cattle. Volunteers are critical to a triathlon. They provide the needed order, preventing collisions and other mishaps. They also keep racers on course (most of the time). So, when I received an email from the race organizer requesting additional volunteers along the race course, I immediately passed the request on to Joy. If you know Joy, you know that she is not only an experienced triathlon volunteer but, more generally, a participant. She would prefer to do almost anything than sit along the sideline waiting for me to complete the race. Without batting an eye, she agreed to volunteer. During packet pickup on Friday afternoon, Joy negotiated a position along the bike and run course a few hundred yards from the transition area. Her spot was at an intersection that doubled as the first turn for the bike and for the run. Triathlon tip: If you have not participated in a triathlon and have some concerns about doing one, start by attending one as a spectator or, better yet, as a volunteer. The water temperature today was a comfortable 78°F (26°C), the upper limit for a ‘wetsuit-legal’ triathlon, according to USAT rules. Do I Use a Wetsuit? Removing a wetsuit after a triathlon swim adds a few tens of seconds to the T1 (swim to bike) time. You can reduce the extra time by unzipping the suit and removing your arms from the suit while running into the transition area after exiting the water. On the other hand, the extra buoyancy that the wetsuit provides leads to a faster pace during the swim. For the distance of the swim for this race, the faster pace and reduced swim time would more than offset the added time in transition to remove the wetsuit. In the end, the decision was to use the wetsuit for the swim. The Battle at Buckhorn Triathlon swim took place in the Buckhorn Reservoir. The reservoir dam is visible on the far shore on the left side of the picture. The final orange turn buoy and yellow sighting buoy are visible at the right. Racers were started in three waves: (1) all women, (2) men age 39 and under, and (3) men age 40 and over. Relay participants started according to the gender and age of the team member covering the swim. Swimmers within each of the three waves left on the triangular-shaped swim course from the ramp between two docks. In my particular wave, 57 males aged 40 and over started together a few minutes after the previous two waves of females and younger males. We swam toward the first orange buoy initially using a yellow sighting buoy to guide us to the first turn. After the first turn, we swam southeast into the sun with the sun a few degrees off the horizon. Considering the sun and distance, the round yellow sighting buoy midway between the two turn buoys became the key to reaching the second turn buoy efficiently. Once we reached the second turn buoy, we made a second left turn and headed to the exit guided by a yellow turn buoy midway and a red inflatable waving pillar at the exit from the water. As shown in the map generated from my GPS watch, my actual path was reasonably straight. 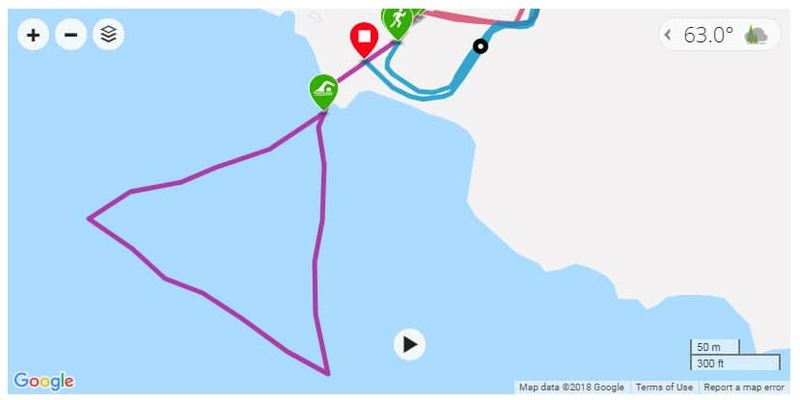 The triangular swim course (purple line) in Buckhorn Lake from a recording made using my Garmin Forerunner GPS watch. The 17-mile (27.4 km) bike course consisted of a series of rolling hills described by one racer from Raleigh as “about as flat as it gets around here”. According to my bike computer, the temperature was in the high 60’s°F. With no wind, these conditions were ideal and certainly a whole lot more comfortable than on the previous two weekends. The course took us on a gentle, roller-coaster of hills through rural residential areas and past small (by Midwest standards) farms, country churches, and a few small businesses, including Triple J Produce near the end of the ride. Given the series of right turns and relatively light traffic on this Saturday morning, riding this course felt safe. Since I could not tell if the driver would turn left or right into their parking spot, I was forced to wait before riding past his vehicle. Finally, he made a commitment and pulled off to the right. The run course involved two loops of the same path, most of which was on a portion of the bike course. The flat course left the transition area onto the road leading out of the Buckhorn Reservoir boat launch, again past my favorite volunteer, Joy. At the end of the road, we turned right and then turned right again at the next intersection onto a street leading to the reservoir dam, located on the eastern edge of the reservoir. I remember chuckling at the young boy running around his yard trying to herd the family’s chickens back into their cage – on both trips. After returning to the parking lot near the transition area the first time, we turned around at an aid (water and sports drink) table and repeated the course. After the second lap, we passed the aid station completing the short run to the finish line. 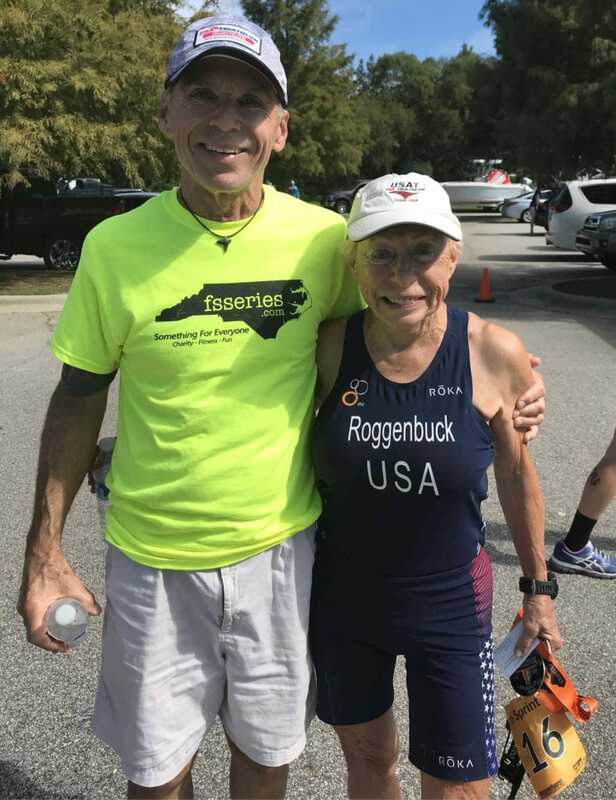 Battle at Buckhorn Triathlon age group winners Paul Bloom (age 71) and Sharon Roggenbuck (age 80). Sharon’s approach to the podium to receive her age group award included a cartwheel. It was then on to Kentucky for the WinSprint Triathlon the following weekend. However, before this, we headed to western North Carolina, visiting Mt. Airy (Andy Griffith’s hometown) and Asheville (home of the Biltmore Estate). Another takeaway from North Carolina is the memory of large patches of orange and yellow wildflowers in the median of divided highways throughout the state. I wish other states would do this. After leaving North Carolina, we spent several fun-filled days in southwestern Tennessee. Here we visited the Great Smoky Mountains National Park, Gatlinburg, and Pigeon Forge (home of Dolly Parton’s Dollywood). It was then onto Winchester (Lexington) Kentucky. First time racing past longhorn cattle, something expected in Texas but not in North Carolina. Joy and I used the week between the Hocking Hills Sprint Triathlon (Logan, Ohio) and the Tennessee triathlon to visit the Creation Museum and Ark Encounter and to camp at Big Bone Lick State Park, all in northern Kentucky. Meanwhile, my search for a hotel near the location of the Dixie Triathlon the next weekend had turned up nothing. The few hotels in the communities around Huntingdon were full on Friday night. As we entered Tennessee on Thursday afternoon, we stopped at one of the first visitor’s centers. The goal was to gather information about camping sites near the race venue. One of the closest options near Huntingdon was Natchez Trace State Park, around 45 minutes drive from the Carroll County Recreation Area. While checking out campgrounds within Natchez Trace State Park, we stumbled upon Pin Oak Lodge. The lodge provided a clean and comfortable air-conditioned room (it was hot and humid outside), a restaurant, and a swimming pool, all among pine trees and with the view of a lake in the background. This was the first time for the Dixie Triathlon. The event had been the dream of a local triathlete, Dr. Volker Winkler. Unfortunately, Dr. Winkler was not able to see his dream come true as he died unexpectedly earlier in the year. However, in his honor, Carroll County officials and residents poured their hearts into making this event a success. McKenzie Medical Center, the clinic that Dr. Winkler helped found, served as the title sponsor of the race. The Dixie Carter Performing Arts Center in Huntingdon was the presenting sponsor. The number and enthusiasm of volunteers supporting the athletes spoke volumes about the commitment of the community to the triathlon. 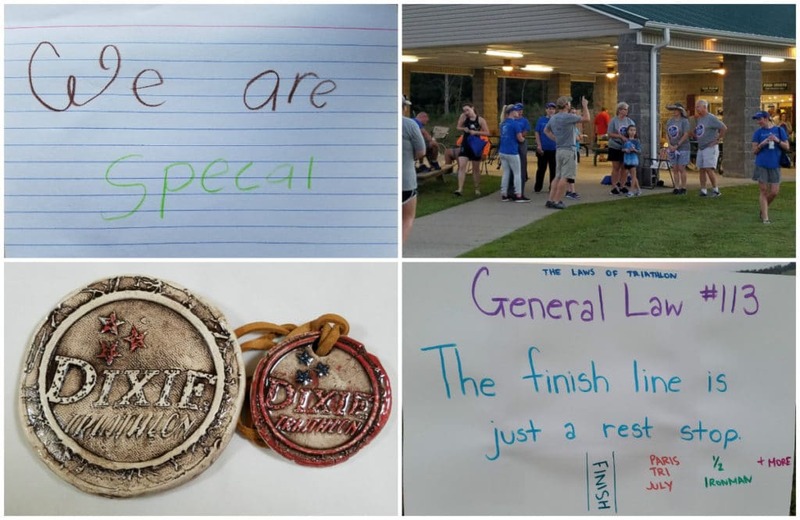 The personal notes from Huntingdon Middle School students in the race packets and the hand-made signs along the race course added to the welcoming feeling. On top of this, all participants received handcrafted ceramic finisher medals produced in the Dixie Performing Art Center’s Mudslingers Pottery Studio awards. Every one of the 300 spots in the race was filled, despite this being the Dixie Triathlon’s first year. Carroll County, Tennessee residents put their hearts into welcoming triathletes to the inaugural Dixie Triathlon. Clockwise from the upper left: Note from Bella S. in my race packet (upper left); Pre-race meeting of volunteers (upper right); One of many signs around the transition area and along the race course (lower right); Handcrafted age group award and finisher medal (lower left). The Dixie Triathlon, managed by Above The Fold Events & Sport Promotions, Franklin, Tennessee, included both sprint and Olympic distances. There was also an option to compete in the sprint distance as a relay team. The transition area was set up in a grassy area in front of the lake and next to the boat ramp and dock. Positions were selected on a ‘first come, first served’ basis with all sprint racers on the side of the main aisle closest to the lake. Since I was among the first people to arrive at the race (we arrived before the opening of the transition area at 5:45 am, though were not the first), I had a good position, one bike position off the main aisle. In setting up my transition area, I did what I have always done for a quick transition – set my helmet upside down centered on the aerobars. Clear safety glasses were set inside the helmet, lenses facing downward and bows standing upward. Checking back sometime later, I found the helmet lying on the ground. Now, however, my glasses were in two pieces – the lenses and the frame. I could not see anything to suggest that the glasses were broken. However, without my reading glasses (‘cheaters’), I couldn’t see any possibility of putting the two pieces back together. Fortunately, Joy found the solution and reassembled the two pieces. I returned the glasses to the helmet still in the transition area. However, this time, I left the helmet and glasses sitting on the ground next to the front bike tire. Just before the beginning of the race, when the transition area was ready to be closed, I put the helmet with glasses back onto the aero-bars. Triathlon tip: During the setup of transition, plan for items in your personal space to be moved. Just before the close of transition, reinspect the area and reposition any of the items that have been moved. After race director Joe Fleenor reviewed key points of the race course, we all joined Carroll County mayor, Joseph Butler, in a prayer thanking God for the beauty of His creation and asking for the safety of the participants. Katie Hodges, Miss Dixie Performing Arts Center, concluded the pre-race ceremony with the singing of the national anthem. The water temperature was over 81°F so, according to USAT rules, wetsuits were not allowed. Beach and three buoys on the rectangular swim course of the sprint distance of the Tennessee Triathlon. The dock from which the swim began and which is next to the exit is located to the left of the picture. I have learned the hard way to always check the bottom of the lake before the race. Lake bottoms vary considerably – some are rocky, some are muddy, and some are slippery. Today, we were swimming in a lake with an uneven, clay bottom that made walking into and out of the water tricky. Participants started in waves by distance, age groups, and gender. All of the Olympic distance groups started first. As the first of the Olympic triathletes completed their swim, the male sprint distance racers started according to their age groups. I started in the group of males aged 50 and over. The group included twenty-six (26) participants. About a minute and a half before the start of our wave, we walked onto the dock and jumped into the water facing the first yellow buoy. The water was deep enough that I never touched bottom upon jumping in. The rectangular shape of the sprint distance swim course involved three left turns. The first two turns were around yellow buoys shown in the picture above. About 75 yards after making the last left turn, the one around the lone orange buoy, we reached the exit. The steep drop-off of the bottom meant that we could swim within a few feet of shore before touching bottom, one already determined to be uneven and slippery. Thankfully, volunteers stationed at the exit helped racers with their footing as they left the water. Triathlon tip: In open water swims, it is helpful to swim as close to the exit as possible, especially when the bottom is difficult to walk on. The mount location for the bike was also unique in that it sloped downward in two directions at the same time – away from the transition area and downward toward the lake. After riding out of the mount area, there was a short flat section of road during which I slipped my feet into the bike shoes. The bike course continued out of the Carroll County 1000 Acre Recreation Area through a small hill onto the road leading into the area. 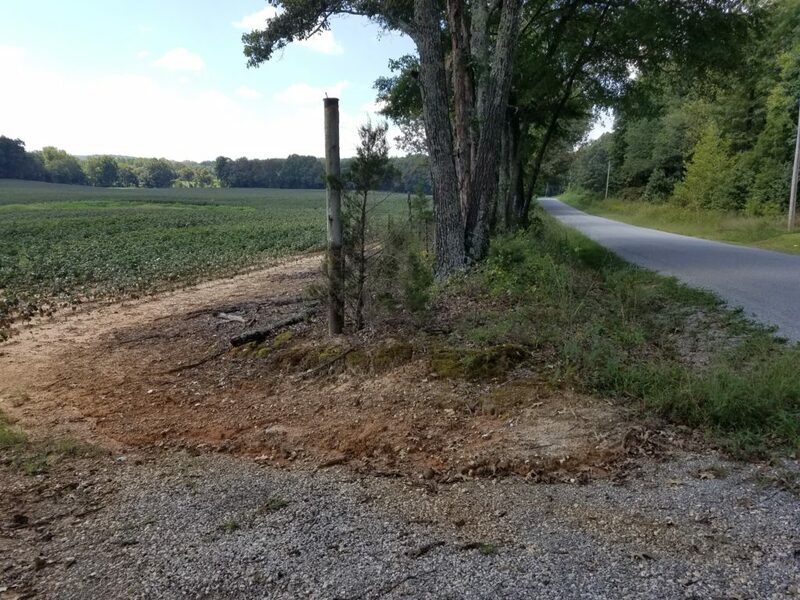 The continuous series of hills took us along country roads past wooded areas and fields of soybeans and cotton (pictured). We passed through the center of Huntingdon, past the Dixie Carter Performing Arts Center and the Carroll County Courthouse. From there we were back on another series of paved country roads. The ‘surprise’ for the sprint competitors mentioned by race director Joe Fleenor during the opening announcements was as feared – a hill of the grade and length that required walking the bike up the last portion of the hill. During the walk, I commiserated with a man of similar age who walked along with me. He informed me that he had known what was coming because he had had the opportunity to ride the course during training. We reminded each other that triathlon is, at least for us, a hobby. Two events made my time on the bike course longer than necessary. The first was my chain coming off the gears as I downshifted in advance of a steep hill. Reinstalling the chain required first flipping the bike upside down. In this position, I could free the chain that had become wedged between the frame and gear. With the chain loose, it was a simple matter of flipping the bike right side up and resetting the chain on both sets of gears. It seemed too risky re-clipping my shoes into the pedals while going uphill. I turned the bike around, coasting downhill while clipping my shoes into the pedals. I made a U-turn to rejoin the race during a break in the flow of bikers. The second cause of wasted time was misreading a sign containing an arrow marking the bike course. Thinking that I had continued onto the course for the Olympic distance, I turned around. Immediately, a volunteer yelled out for me to turn back around and make a right turn at the next intersection. A rare flat section of the bike course passed fields of soybeans and cotton. The temperature at the start of the race was 72°F with a relative humidity of 89%. By the time I hit the run course, the temperature was in the high 80s°F. The combination of temperature, humidity, and hills made this also one of the toughest runs. Senior triathlete and personal trainer, Jeanne Minder, told me that I had not trained enough in these conditions of heat, humidity, hills, etc. Another lesson to take from this race. Eavesdropping on conversations while re-hydrating after the race, I was comforted to hear from other seasoned triathletes from the southeast part of the USA say that this was ‘the’ or ‘one of the’ hilliest bike courses of a triathlon. Of course, I also overheard one guy say that people from ‘eastern Tennessee would not even consider this course to be hilly’. The race committee provided a generous and diverse table of foods – pizza, donuts, bananas, oranges, and chips – and soft drinks and water for participants to re-hydrate and recover. 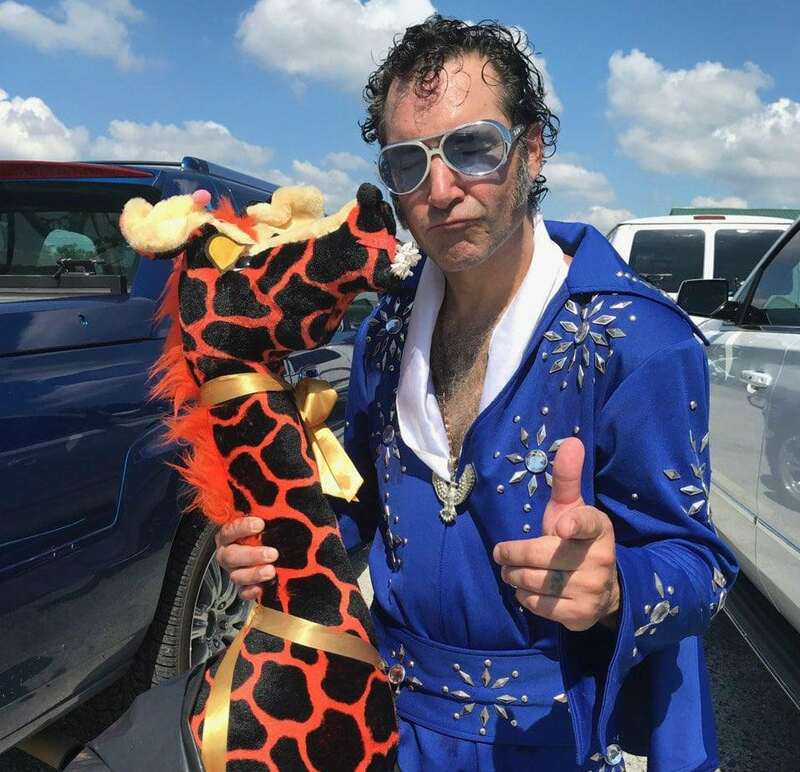 Elvis, one of the triathlon participants, with the Giraffe. Before the Georgia triathlon the next weekend, we headed toward The Villages, Florida for a week with friends, Don & Sue. This would also be the end of the trip for the stuffed giraffe which had hitchhiked a ride in the back of our van. The giraffe would take up residence in central Florida with her owner, Debby P.
First time participating in an inaugural triathlon. First time riding past cotton fields. First time losing time on the bike course because of misreading a course marker.